Critics were cat-haters but "Dr. Seuss' the Cat in the Hat" had families purring. 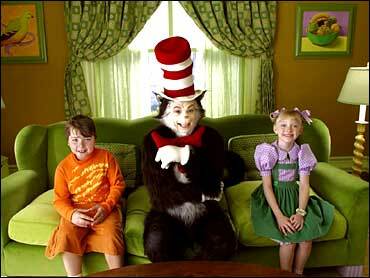 Starring Mike Myers as the whiskered trickster of Dr. Seuss' children's book, "The Cat in the Hat" overcame searing reviews to debut as the No. 1 weekend movie with $40.1 million, according to studio estimates Sunday. Halle Berry's supernatural thriller "Gothika" premiered in second place with $19.6 million while the previous weekend's top movie, "Elf," slipped to No. 3 with $19.1 million. Playing in 3,464 theaters, "The Cat in the Hat" averaged $11,570 a cinema, compared to $8,237 in 2,382 theaters for "Gothika." Critics were even more unkind to "The Cat in the Hat" than they were to the earlier live-action Dr. Seuss adaptation, "How the Grinch Stole Christmas." That movie had a $55.1 million debut weekend and survived bad reviews to become 2000's top-grossing flick with $260 million. Reviewers called "The Cat in the Hat" visually overblown and bereft of story. Some especially tough critics referred to the movie as "kitty litter." Universal Studios, domestic distributor for both movies, does not expect "The Cat in the Hat" to rival the total for "The Grinch," whose saving grace even among harsh critics was a manic performance by Jim Carrey. "The Grinch" also had appeal for teens and adults who fondly recalled the TV cartoon version, while "The Cat in the Hat" was a movie made solely for young children, said Nikki Rocco, head of distribution for Universal. "It's not about entertaining parents or reviewers. It's about entertaining kids, and that's what happened," Rocco said. "It's whether or not your audience was satisfied, and every time I saw the movie with an audience of kids, they loved it." "The Cat in the Hat" may hold up well through the holidays, a prime time for families to head to the movies, said Paul Dergarabedian, president of box-office tracker Exhibitor Relations. "Universal really marketed the heck out of this movie. I don't think there could be a kid in America who didn't know about it," Dergarabedian said. "Little kids, they want what they want, and they don't care about reviews. Parents do have some say in the decision, but most of the time, they'll just go along with the kids. Who wants a screaming kid complaining they can't go see a movie?" For adult crowds, the drama "21 Grams" opened impressively in limited release. A film-festival hit, "21 Grams" took in $256,434 in just eight New York City and Los Angeles theaters, averaging a whopping $32,054. The movie expands to about 60 theaters Wednesday. The film stars Sean Penn, Naomi Watts and Benicio Del Toro as three strangers tossed together in a somber exploration of grief, vengeance and mortality. All three actors are potential Academy Awards nominees. "The Barbarian Invasions," Canada's entry for the foreign-language Oscar category, also debuted strongly in limited release, taking in $75,480 at three theaters for a $25,160 average. "The Matrix Revolutions," the conclusion to the Wachowski brothers' sci-fi trilogy, continued its box-office swoon, taking in $6.7 million, down 59 percent from the previous weekend. The movie likely will top out at barely half the $282 million gross of its predecessor, last spring's "The Matrix Reloaded." Estimated ticket sales for Friday through Sunday at North American theaters, according to Exhibitor Relations Co. Inc.
"Dr. Seuss' the Cat in the Hat," $40.1 million. "The Matrix Revolutions," $6.7 million. "Looney Tunes: Back in Action," $4.1 million. "Scary Movie 3," $3.3 million.